The Board of Directors (the “Board”) of APT Satellite Holdings Limited (the “Company”) is pleased to announce the audited consolidated results of the Company and its subsidiaries (the “Group”) for the year ended 31 December 2018. In 2018, the Group’s revenue amounted to HK$1,237,712,000 (2017: HK$1,207,440,000), representing an increase of 2.5% amounting to HK$30,272,000 as compared to 2017. In 2018, the Group’s profit before taxation amounted to HK$619,628,000 (2017: HK$621,792,000), representing a decrease of 0.3% amounting to HK$2,164,000 as compared to 2017. In 2018, the Group’s profit attributable to equity shareholders amounted to HK$507,007,000 (2017: HK$504,557,000), representing an increase of 0.5% amounting to HK$2,450,000 as compared to 2017. Basic earnings per share and diluted earnings per share were HK54.47 cents (2017: HK54.20 cents). During the year, the Company has declared and paid an interim dividend in cash of HK4.00 cents per ordinary share. According to the policy for continuous increase of the investment return of shareholders, the Board has resolved to declare a final dividend in cash of HK11.50 cents per ordinary share for the financial year ended 31 December 2018 (2017: HK10.50 cents per ordinary share). The final dividend is conditional upon the passing of the relevant resolution at the forthcoming annual general meeting (the “Annual General Meeting”) which will be held on Thursday, 23 May 2019. The final dividend will be paid on or about Friday, 21 June 2019 to shareholders whose names appear on the register of members at the close of business on Thursday, 6 June 2019. 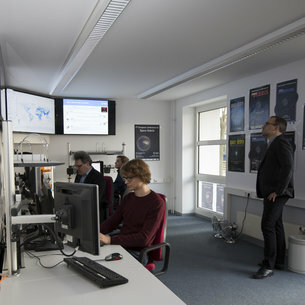 During the year, except for APSTAR-6, the Group’s in-orbit satellites and their corresponding ground TT&C (telemetry, tracking and command) systems and earth station have been operating under normal condition and continue to provide reliable and high quality services to the Group’s customers. The Group’s in-orbit satellites, namely, APSTAR-5C, APSTAR-6C, APSTAR-7 and APSTAR-9, have integrated to form the super wide and strong satellite service capability provided to Asia, Australia, Middle East, Africa, Europe, and the Pacific region, covering more than 75% of the world’s population. APSTAR-5C was successfully launched on 10 September 2018 on board of Space X Falcon 9 launch vehicle. APSTAR-5C is based on the Space System Loral FS-1300 platform, it is equipped with 28 C-band, 35 Ku-band/Ka-band transponders (including conventional and high-throughput (“HTS”) payload), providing high power transponder services to customers across the Asia-Pacific region for video broadcasting and distribution, Direct-To-Home (“DTH”) service, VSAT, maritime and broadband telecommunication services. APSTAR-5C carries seven wideband beams and one regional HTS beam. Not only can the Group taken up its existing services for APSTAR-5, it can expand to broader service areas with more powerful performance, especially its new HTS capacity for Southeast Asia, and will satisfy the growing market demand in higher quality telecommunication services. APSTAR-5C has replaced APSTAR-5 and commenced commercial operation on 1 December, 2018. APSTAR-5 is currently operating in an inclined orbit. APSTAR-5C is a satellite jointly built by the Group and a subsidiary of Telesat Canada, and it is also known as Telstar-18V. The Group holds approximately 57% interest in the satellite. APSTAR-6C was successfully launched on 4 May 2018 on board of Long March 3B/E launch vehicle. APSTAR-6C is a high-power geostationary communication satellite based on the China Academy of Space Technology DFH-4 series platform carrying 26 C-band transponders, 19 Ku-band/Ka-band transponders, which provide high power transponder services to customers across the Asia-Pacific region, for video broadcasting and distribution, VSAT, DTH, cellular backhaul, and in-flight and mobility broadband applications. APSTAR-6C has replaced APSTAR-6 and commenced commercial operation on 1 July 2018. APSTAR-6 suffered partial power loss due to anomaly of south solar array on 27 May 2018. Since the services were taken up by APSTAR-6C satellite in a timely manner, the partial failure of APSTAR-6 did not impose real impact on the operation of the Group. For the loss caused by this failure, the Group has notified the insurer and the claim procedures are nearly completed. At present, APSTAR-6 operates in an inclined orbit. APSTAR-7, positioned at 76.5 degree East geostationary orbital slot, is equipped with 28 C-band transponders and 28 Ku-band transponders with footprints covering the regions in Asia Pacific region, Middle East, Africa and Europe. APSTAR-9 positioned at 142 degree East geostationary orbital slot, is equipped with 32 C-band transponders and 14 Ku-band transponders with footprints covering the regions in Asia, Australia, New Zealand, Pacific Islands and Hawaii. APT Mobile SatCom Limited (“APT Mobile”), an associate which was initiated and formed by the Group in Mainland China, has been developing APSTAR-6D, a HTS satellite which is aimed to provide services for the rapid-growing satellite broadband mobility services across Asia Pacific region and the Mainland China. APSTAR-6D is scheduled to be delivered on ground at the end of 2019. In 2018, the transponder market conditions in the global and Asia Pacific region was continuously downturn. The business growth for satellite broadcasting and satellite telecommunication had been weak and the market environment on oversupply of satellite transponder and the decline in the transponder lease price remained unchanged. To cope with the severe fierce market competition, the Group has actively explored new markets and new businesses and continued to enrich the service contents and varieties while providing high quality services to the customers. The Group has attained excellent performance on the increases in both revenue and profit after taxation and the utilisation rate has continued to be at relatively high level. With the Non-domestic Television Programme Service Licence, the Unified Carrier Licence and the satellite earth station facilities and data centre facilities, the Group will continue to expand the scope of services and provide customers with satellite TV broadcasting and uplink services, satellite telecommunication services and data centre services. The Group has rich experiences in satellite procurement and project management, which enable the Group to provide the satellite technical and project management consulting services to other satellite operators. Apart from the satellite project management service provided to APT Mobile, the Group has entered into a satellite project management and consultancy service agreement with a satellite operator in Asia Pacific Region during the year. In pursuance with the agreement, the Group will provide to the customer professional consultancy services in respect of the satellite construction, launching, and in-orbit test. Looking into 2019, the global and Asia Pacific Region satellite transponder market is continuing under the condition of oversupply and fierce competition. The Group’s satellites, APSTAR-5C, APSTAR-6C, APSTAR-7 and APSTAR-9, as the premium satellite resources, will continue to face the fierce competition pressure in the transponder leasing business. Therefore, the Group will try its best effort to maintain the stable growth of the current business and further strengthen the marketing effort for exploring new businesses and new markets, so as to support the sustainable and stable development of the Group. Note 1: EBITDA is defined as profit from operations before other net income, valuation (loss)/ gain on investment properties, impairment loss in respect of property, plant and equipment, loss on disposal of property, plant and equipment, depreciation and amortisation. For the year ended 31 December 2018, the Group’s revenue amounted to HK$1,237,712,000 (2017: HK$1,207,440,000), representing 2.5% increase as compared with 2017. The growth in revenue was mainly due to the service income from provision of technical support and project management services to an associate. The profit attributable to shareholders increased by 0.5% to HK$507,007,000. HK$128,700,000) for an impaired satellite under its insurance policy, actual amount of compensation subject to confirmation with insurers. The estimated insurance compensation was recognised in other receivables. Finance costs HK$10,562,000 was recognised for the year ended 31 December 2018 (2017: Nil). The increase was primarily due to the finance costs for payments in respect of APSTAR-5C and APSTAR-6C after commercial operation were no longer capitalised. Based on the market price as at 31 December 2018, the balance of 141,651,429 ordinary shares of CNC Holdings Limited was remeasured at a fair value of HK$9,207,000, with fair value gain of HK$1,841,000 recognised in profit or loss. The details of financial assets measured at fair value through profit or loss of the Group are set out in note 15 of this announcement. Income tax expenses for the year ended 31 December 2018 decreased to HK$112,621,000, as compared to HK$117,235,000 in 2017. The decrease was mainly due to the decrease in provision for deferred taxation for the current year. The details of income tax of the Group are set out in note 8 of this announcement. As a result of the increase in revenue, EBITDA for the year ended 31 December 2018 increased to HK$1,032,428,000, with the margin decreased from 84.4% to 83.4%.